Home AC Technician Construction Jobs Kazakhstan Supervisor Welder Recruitment to Kazakhstan - Arabtech & Consolidated Contractors International Co. 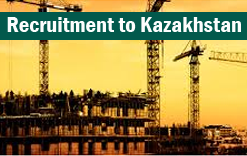 Recruitment to Kazakhstan - Arabtech & Consolidated Contractors International Co.
CCC’s origins go back to 1952 when three talented young entrepreneurs, the late Kamel Abdul-Rahman, the late Hasib Sabbagh, and Said Khoury, joined forces to create one of the first Arab construction companies. Arabtec Construction L.L.C. is the leading construction company in the United Arab Emirates. Since its launch in 1975, it has executed a diverse and far-reaching portfolio of major construction projects in all sectors of real estate and infrastructure. Today, the company encompasses an array of plant and state-of-the-art equipment as well as a multinational team of more than 40,000 highly qualified staff. Arabtech & Consolidated Contractors International Co. JV requires the following MEP Personnel for their Building Construction Project on immediate basis. Candidate having minimum 5 years of overseas experience to rush their CV’s & Certificates to vacancies@indman.com as only shortlisted candidates will be permitted to attend the Final client interview on 30th December 2016.